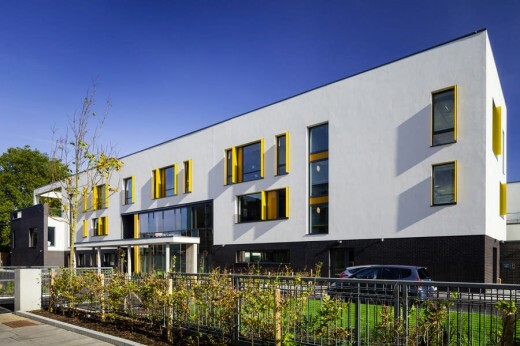 Avanti Architects’ £8m Beatrice Tate School for pupils with severe/profound and multiple learning difficulties has now officially opened near Mile End. 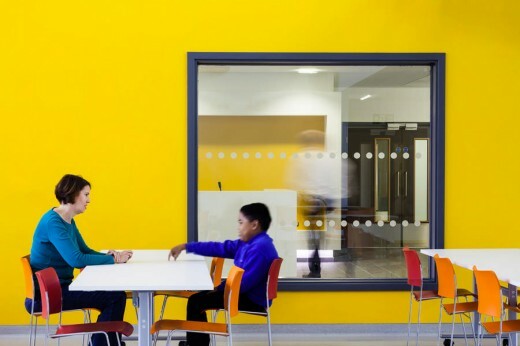 The building provides and inclusive and stimulating new learning environment for students and staff alike, replacing facilities in an outdated and cramped site near Bethnal Green. 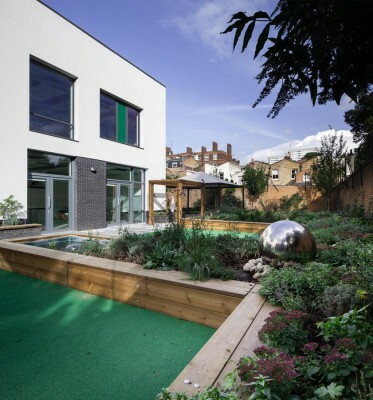 The new three-storey building located within the site of a former Victorian workhouse on Southern Grove south of Mile End Road provides learning and specialist therapeutic facilities (including hydrotherapy and specialist sensory rooms) for up to 80 secondary level students. The design reflects the school’s vision for a building rooted in its community which forgoes the high fences which can form a barrier between school and public. 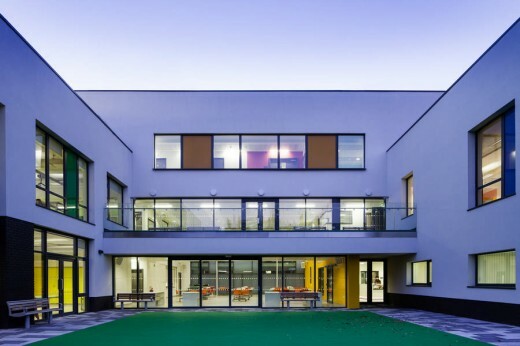 The process of student arrival by bus and movement into the classrooms has informed the concept which creates a continuous permeable flow of space via the central double-height social hub through to the outdoor play area allowing the spatial relationships between all parts of the building to be immediately legible on arrival. This has fulfilled the school’s desire to retain a sense of inclusivity and intimacy in spite of the new facilities being double the area of the previous school and arranged on three floors. The form of the building maintains a dialogue with the scale and proportion of the adjacent Victorian workhouse which will be fully appreciated as the long-term masterplan for the site to the north is implemented to open the centre of the site and fully reveal the historic building as the centrepiece of the composition. The articulation of the frontage provides an appropriately scaled and striking civic presence on the street. The main entrance axis is marked by a symbolic portal at the pavement edge. The use of material and colour is driven by an inclusive use of contrast and strong visual cues. 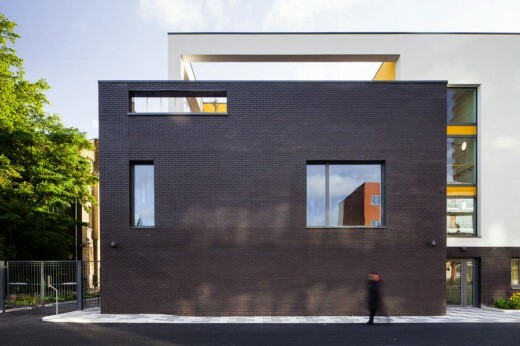 A black engineering brick plinth varies in height and anchors the building to the site. The two storey volumes of the sports hall and pool relate to the brick workhouse adjacent. The a unified white Sto render volumes which float above emphasise the horizontality of the frontage with the whole animated by touches of colour according to building zone. The use of vertical translucent glass fins has a dual purpose, mitigating solar gain as the sun travels around the building in the afternoon and allowing the playful composition of the main elevation to be perceived from a distance when approached from north or south along Southern Grove. 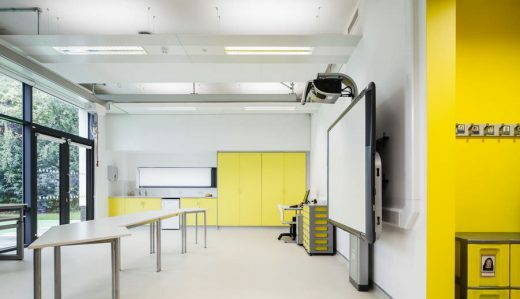 The play of light on the fins which enters the specialist teaching rooms changes depending on season and time of day providing a sensory interaction between student and environment. The building has achieved a 25% improvement on Part L 2010 energy standards and is at the upper end of its BREEAM ‘Excellent’ score achieved through high passive fabric efficiency and air tightness with energy provided by a CHP plant (which delivers heat to the pool), solar panels and air source heat pumps. The school have now completed the decant process and are enjoying inhabiting the variety of spaces and therapeutic facilities. They especially appreciate how the design has been able to project their ethos and has become a beacon for special needs learning in their community.